Luciferion is a death metal band founded in early 1993 by Michael Nicklasson, Peter Weiner and Wojtek Lisicki. They were joined shortly after by Martin Furängen. The band was influenced by Morbid Angel, Deicide, Celtic Frost, Forbidden, Coroner, Immolation, and other heavy metal bands of the 1980s. 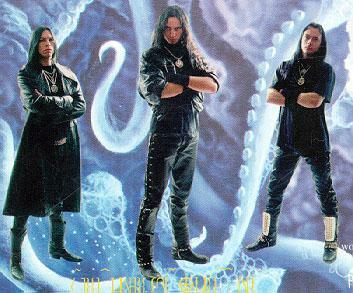 Luciferion made their first recording, a five-song promo, in 1993. The promo led to an immediate record deal with Listenable Records, in France. Listenable Records was the only company to receive the promo, which they released under the title, "The Demon of 1994." In 1994, Luciferion recorded the album "Demonification (The Manifest) at Studio Fredman in Gothenburg, Sweden, in the studio of Fredrick Nordström. The album featured a version of "Blasphemer," originally recorded by Sodom. After the session, the drummer Peter Weiner left the band and returned to his previous band Sarcazm. He was replaced by Hans Nilsson, the former drummer of Liers in Wait. Johan Lund, who was responsible for the technical part behind synthesizers on the album, now became the live keyboard player of the band. The band disbanded at the end of 1996, although members gathered after that to record tribute songs for several compilations. During the band’s lengthy break, Michael Nicklasson joined Dark Tranquility and Wojtek Lisicki together with Martin Furängen revived their old true-metal act Highlander, now known as Lost Horizon. Hans Nilsson joined Crystal Age, and later became a member of several other bands: Diabolique, Dimension Zero, and The Great Deceiver. In 2000, the band came together again with Listenable Records, planning to release an album consisting of their original promo, "The Demon of 1994" and the unreleased Celtic Frost cover "The Circle of Tyrants." They continued to create new music, and released a second full-length album, "The Apostate (First Step To Salvation)," in 2003.